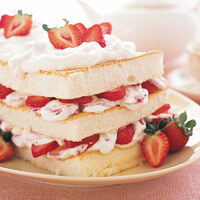 Strawberry-Angel Food Cake...this picuture is taken by me! My father was too bored and busy with lots of work so I decided to refresh him by making a tasty meal and I selected the Strawberry-Angel Food Layer Cake. I made it for him and he was too excited & he gave me a clap. I was too happy! So following is the method of making it. So begin to cook it for your tired father. Preheat oven to 350F (180C) degrees. Grease 15 1/2-inch by 10 1/2-inch jelly-roll pan. Line pan with waxed paper; grease waxed paper. Into small bowl, sift flour and confectioners' sugar. In large bowl, with mixer at high speed, beat egg whites and salt until soft peaks form. Sprinkle in 2/3 cup granulated sugar, 2 tablespoons at a time, beating just until whites stand in stiff, glossy peaks when beaters are lifted. Beat in vanilla. Sift flour mixture, one-third at a time, over beaten egg whites; fold in with rubber spatula just until flour mixture is no longer visible. Spread batter evenly in prepared pan. Bake 25 to 30 minutes or until cake springs back when lightly touched. Cool completely in pan on wire rack. Invert cake onto cutting board; carefully peel off waxed paper. While cake cools, prepare strawberries and whipped cream. Set 5 or 6 smaller berries aside; reserve for garnish. Hull and slice remaining strawberries. In large bowl, with mixer at medium speed, beat cream and remaining 2 tablespoons granulated sugar until soft peaks form. Reserve 3/4 cup whipped cream. Fold strawberries into whipped cream remaining in bowl. With serrated knife, cut cake into 3 equal strips, about 10-inch by 5-inch each. Place 1 cake strip on platter; spread with half of strawberry whipped cream. Top with 1 more cake strip then with remaining strawberry whipped cream. Top with remaining cake. Spread reserved whipped cream on top of cake. Cut each reserved strawberry in half; use to garnish platter and top of cake. Refrigerate if not serving right away. My 2 1/2 year old and I made this together for her nursery class. They not only lapped it up but asked for more! Of course we had to "try it out" first at home and there was not a single crumb left in any plates! Very easy and very delicious! If you want to take it to go, just refrigerate the layer filling in a sealed bowl and build the cake wherever you go. This recipe is so delicious! It was quick and easy! Absolutely LOVE it! YAAR ITZZ....AMAZING LUV U U AND IT ..
thanx becuz.....its my fav. dish i luv it... thanx...4 the recipe now my mom will also try it..all the best...! i will try it & i am sure u will get it. i have tried it, it's too amazing in taste and nutritious too i love it..